So you’ve started to kick the tires of the Windows 8 Consumer Preview and now you are building an app. You’ve read all the UX design guidelines and started looking at some great apps on the store. Perhaps you’ve also viewed the online documentation and some samples? And you’ve likely read about the contract implementations and other charms items like custom settings. The text items underneath your app title are referred to as commands. Each application will always get the Permissions command. When the user clicks this they will get some “about” information on your app (name, version, publisher) as well as the permissions the app has requested. As an app developer, you have to do nothing to get this experience. 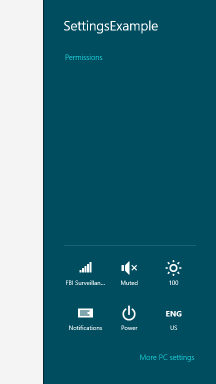 In addition to that the Settings pane shows some OS-level options like volume, Wi-Fi, brightness, etc. that the user can manipulate. But you, my fellow app developer, can also implement custom settings options in your app. The first thing you have to do to customize your experience is implement a custom SettingsCommand. These are implemented by first listening to when the SettingsPane will request if there are any additional commands for the current view. 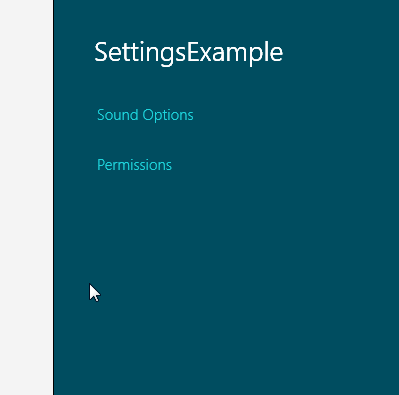 Settings can be global if you have something like a “master” page setup in your XAML application, but can also be specific to a currently viewed XAML page. It is not an either/or but a both. I’ll leave the exercise up to you and your app on when you need which (or both). You are able to add the text-based commands to the SettingsPane at this time. The second argument I provided above will be the text that will display as the menu. Notice how here I’m using ResourceLoader to get the string value for the text to be displayed. This is a best practice to ensure you give your user’s the best experience. Even though you may not localize now, setting this up in the beginning makes it way easier to just drop in localized strings and not have to change code. The “SoundOptionCommandText” exists as a key/value pair in a file in my project located at en/Resources.resw. Yippee! Your custom commands will show before the Permissions one. The next step is to actually add something valuable to the user when they click on this new command…and that means some UI. When your user clicks your new shiny command you want them to see some shiny, but relevant UI. If you were using HTML/JS you would use the WinJS.UI.SettingsFlyout control to do a lot of this for you. There is a sample of this for comparison located in the Windows 8 developer samples. In XAML there isn’t the literal ‘SettingsFlyout’ control equivalent, but a set of primitives for you to create the experience. There are a few pieces you will need in place. Notice we are also listening for the Popup.Closed event. This is so that we can remove the OnWindowActivated method to avoid any reference leaks lying around. Great, now let’s put some UI into our Popup. And if the user taps/clicks away from the dialog then it automatically dismisses itself. You now have the fundamentals on how to create your custom UI for settings. While this is simple to implement, there are some key guiding principles that make this key for your user’s experience. First and foremost, this should be a consistent and predictable experience for your users. Don’t get crazy with your implementation and stay within the UX design guidelines to ensure your app gives the user confidence when using it. Additionally, here are some of my other tips. You may be curious to see the XAML used for my custom UI and I’ve included that in the download at the end here as not to take up viewing area here on the key areas. Unlike some modal dialog experiences, the Settings experience should create immediate change to your application. Don’t put confirmation/save/cancel buttons in your UI but rather have the changes take effect immediately. 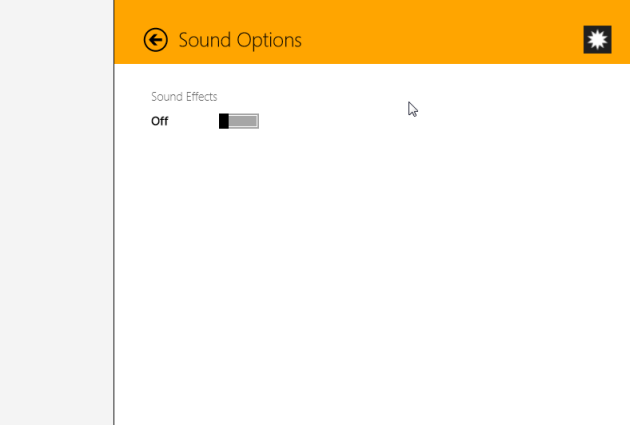 For instance in my sound example, if the user invokes the Settings charm, clicks/taps on my Sound Options and toggles the Sound Effects option on/off, then the sound should immediately turn on/off. Now implementing this philosophy may change the way you create your custom UI and/or UserControl, but take that into account when designing. This concept of light dismiss is about honoring the user’s action and not requiring interruption. This is why we use the Popup.IsLightDismissEnabled option as we get this capability for free. By using this if the user taps away to another part of the application or Window, then the Popup simply dismisses. Don’t hang confirmation dialogs in there to block the user from doing what they want, but rather honor the context change for them. Combine all these and you will be set. Everything I talk about above is supported in XAML and WinRT. My example is in C# because I’m most proficient in that language. But this 100% equally applies in C++ as well and should be identical in practice. You may be saying to yourself wouldn’t this make a great custom control? Ah, stay tuned and subscribe here :-)!